New release: 1964 saw not only the Spy Boom launched by Goldfinger and The Man From U.N.C.L.E., but also the British Invasion led by The Beatles and the continuation of the Monster Craze with new programs like The Munsters and The Addams Family. And even as the Universal Monsters reigned via TV syndication, model kits, and magazines like Famous Monsters of Filmland, there was still the kind of Cold-War anxiety about radiation and the Bomb that was reflected in the giant-mutant movies of the 1950s. 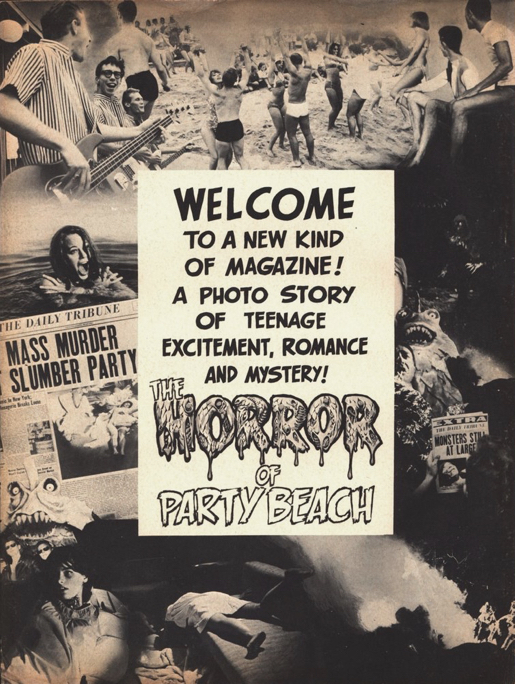 Cue an independent film production from Connecticut about these tensions, mix in some teenagers, add a touch of surf music by the Del-Aires (ala Beach Boys 1961-1964), and you get a little monster cocktail called Horror of Party Beach! Note: this movie is a bomb- not the bomb, but it's still a fun ride. Maybe you saw the Mystery Science Theater 3000 version? 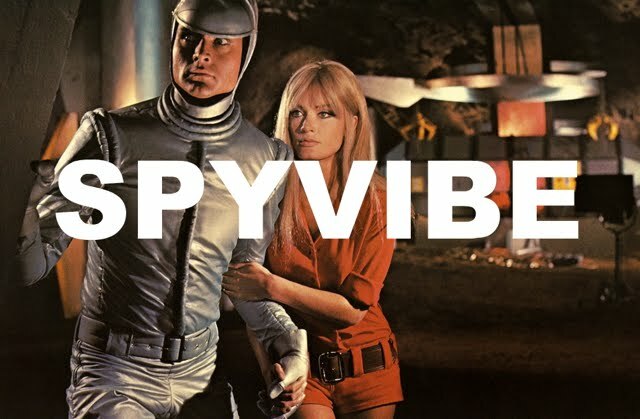 Now Spy Vibers can dive into the deep end in glorious hi-definition with a new Blu-ray from Severin. From the press release: "In 1964, 20th Century Fox released an independent shocker – shot in two weeks for $50,000 outside Stamford, Connecticut by local producer/director Del Tenney – advertised as ‘The First Horror-Monster Musical’. 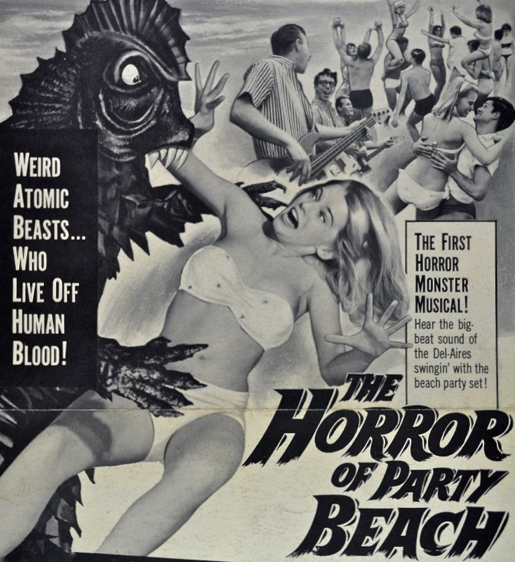 More than 50 years later, this “absolute classic of exploitation cinema” (Legends Magazine) returns like you’ve never seen or heard it before: When nuclear waste dumped into the ocean mutates a shipwreck full of corpses, it will unleash an onslaught of bikini teens, surprising gore, dubious science, an intrepid maid, The Del-Aires, and arguably the greatest worst monsters in horror movie history. Severin is proud to present this cult favorite from “Connecticut’s own Ed Wood” (Stamford Advocate), now featuring a new 2k scan from the original negative and loaded with all-new Special Features like nothing that ever stalked this earth!" 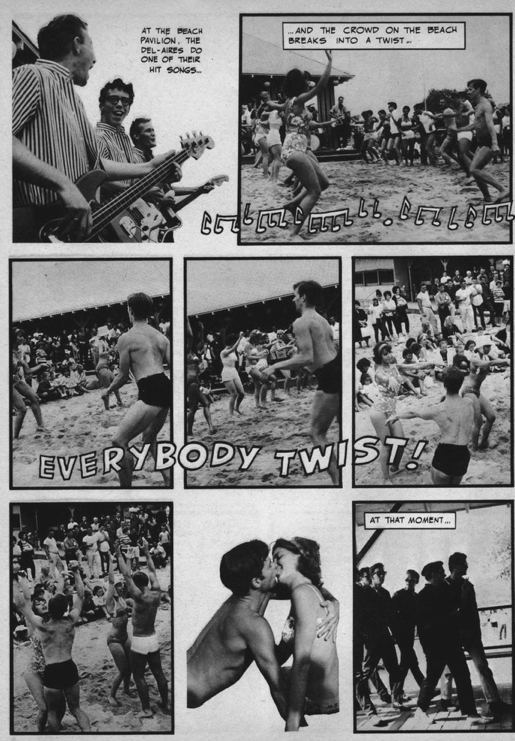 Bonus features include: Return to Party Beach: A Retrospective Documentary on The Horror of Party Beach, It’s the Living End: An Encounter with The Del-Aires – Interview with Band Members Bobby Osborne and Ronnie Linares, Shock & Roll: Filmmaker Tim Sullivan On Rock & Roll Horror Movies, Archival Interview with Director Del Tenney, Trailer. On DVD, Blu-ray and in a Blu-ray bundle with an enamel pin and your own beach ball! 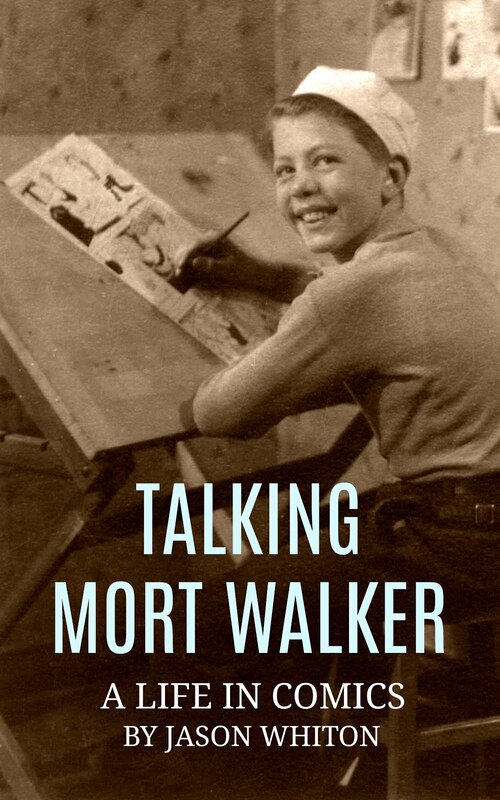 More info at Severin and Amazon. Below: Images from the Warren fumetti/photo-magazine by Wally Wood and Russ Jones, promo graphics, and video trailer for the new release. Enjoy! 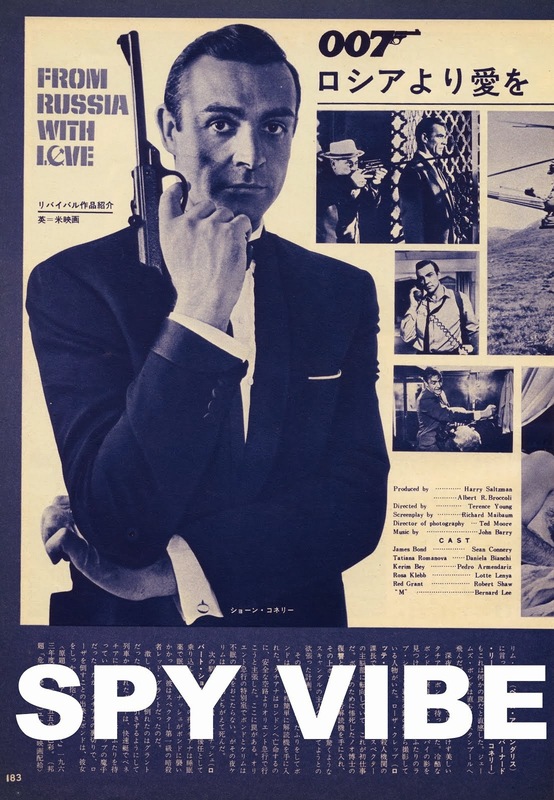 Selected Spy Vibe Posts: Sylvie Vartan Renown, Ringo At 78, Dark Shadows Strips, Spy Vibe Radio: Flint, Archie Batman 66, Paul at 76, Beatles Pac-Man, Spy Vibe Radio: Jerry Cotton, The Invaders, 007 Horowitz Book Tour, McGoohan/Prisoner Event at Elstree, The Prisoner Interviews Vol 1, British Underground Press, Interview: Fab4 Mania, Bond Cocktail Book, Bond at Bletchley, Spy Smasher, Spy Vibe Radio: Peter Gunn, Agent Zero M, New Prisoner Comic, Dr. No Villains Edition, Spy Vibe Radio: Danger Diabolik, Dr. No 60th, Oy-Oy-Seven, Spy Vibe Radio (UFO), Cold War Comic Strips, Thunderball Event, Mission to India, Mort Walker Celebration, Peter Wyngarde Celebration, Batman 66 Exhibit, Prisoner Fifty Event, Ian Fleming Publications 2017-2018, Interview: Ed Hulse Pulp, Avengers Audio Drama, Interview: Callan At 50, Interview: Playboys, Spies, Private Eyes, TWA Returns, Spy Vibe Radio 8, Interview: Ryan Heshka, Mid-Century Modern Schulz, Agent Werewolf, Mata Hair Exhibit, Johnny Sokko 50th, Interview: Trina Robbins, Eddie Izzard, The Prisoner Capt Scarlet 50th, Hugh Hefner R.I.P., Jack Good R.I.P., Interview: Shaken Not Stirred, Callan 50th, Spy Vibe Radio 7, The Prisoner 50th Event, Spy-Fi Event, Kaho Aso 007, Two Million, Bo Diddley, Carnaby Pop, Le Carre Events, Billy Bragg Skiffle, Elvis 68, Jack Kirby The Prisoner, Casino Royale Concert, Review: The Prisoner Vol 2, Interview: The Prisoner Essential Guide, Maud Russell Mottisfont, Spy Vibe Radio 4, Batman Gallants, Adam West R.I.P., Village Triangle, Roger Moore R.I.P., Spy Vibe Radio 3, Sgt Pepper 50th, Satanik Kriminal OST, 60s Overdrive, Make Love in London, Spy Vibe Radio 2, Spy Vibe Radio 1, James Bond Strips, Propaganda Mabuse, Interview: Police Surgeon, XTC Avengers, 1966 Pep Spies, Batman Book Interview, Exclusive Fleming Interview, Avengers Comic Strips, Robert Vaughn RIP, UNCLE Fashions, Thunderbirds Are Pop!, Interview: Spy Film Guide, Lost Avengers Found, The Callan File, Mission Impossible 50th, Green Hornet 50th, Star Trek 50th, Portmeirion Photography 1, Filming the Prisoner, Gaiman McGinnins Project, Ian Fleming Grave, Revolver at 50, Karen Romanko Interview, Mod Tales 2, Umbrella Man: Patrick Macnee, New Beatles Film, The Curious Camera, Esterel Fashion 1966, Exclusive Ian Ogilvy Interview, 007 Tribute Covers, The Phantom Avon novels return, Ian Fleming Festival, Argoman Design, Sylvia Anderson R.I.P., Ken Adam R.I.P., George Martin R.I.P., The New Avengers Comics, The Phantom at 80, 007 Manga, Avengerworld Book, Diana Rigg Auto Show, The Prisoner Audio Drama Review.